The company history is somewhat convoluted, but it was acquired as the mobile phone (cellphone) arm of French communications giant, France Telecom, in 2001. Since 2006 it has taken a broader role, as the global brand in front of many of the parent company's services - in particular, internet. The folks over at Metaversatility are responsible for the build, and it shows. It is of superb quality. It is a double sim build which is very open and green. 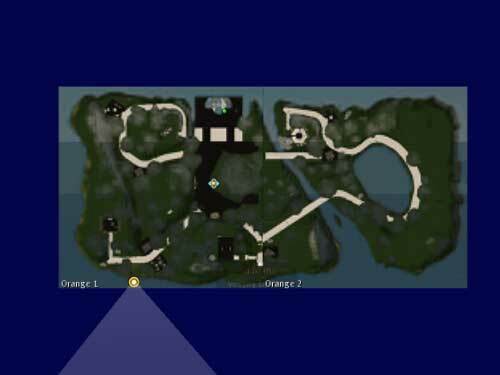 If I'd list the features of this island, you'd say it's nothing special, nothing new. In this build you will find the usual stuff: Auditorium, workspace / meeting room, some info spaces and some spaces to chill. The quality of this build is that it's not all jammed together in a real-life office building but uses the option that a virtual world has to offer. The spaces are set up in an outdoor scene with lots of trees, water and small hills. You won't find a rooftop here and you can just fly in to wherever you want to be. For those who are still a little awkward with flying around, there are also paths that lead you to the various spaces. There's a few things that are worth checking out. There's a massive sound sculpture blocking your path (should you choose to walk the path). 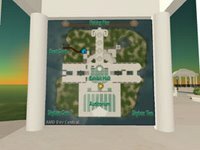 There's also a hangglider if you don't want to navigate yourself. For more on the orange buid there are excellent pictures at KZero and also a good story at Aleister's Ambling in Second Life. 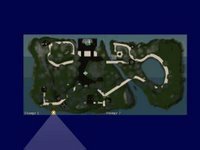 This is a tale beyond a succesful immersion - even when the island hasn't seen it's final version and opening yet. This is a tale of creating a brand 21st century style in a 19th century business. The business I'm referring to is that of making wine, a traditional profession that -at least in Europe- brings images of old, weathered farmers and old French chateau's. It's classic and romantic and absolutely non-tech-savvy. 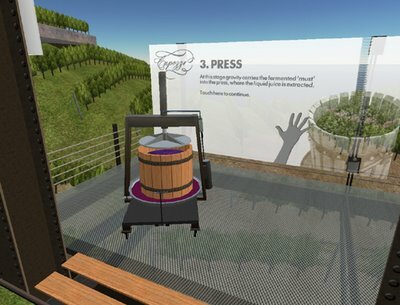 During the 20th century we have seen the rise of new wineproduction areas, like California, South Africa and New Zealand gaining popularity over the traditional French and Spanish wines. 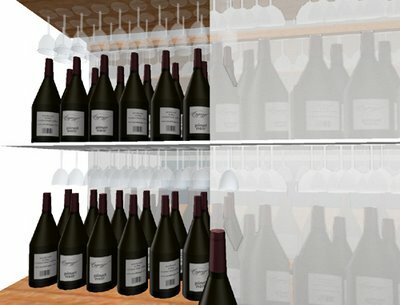 The popularity of these new wines are partly because these wineries use modern technology to create well balanced wines and of a more constant quality than the traditional French ones. To start off by calling this a hyperjump and getting all excited about it does raise some expectations. Why? If you look at the sim -without its context- it's nothing special. It is a quality build, as expected when built by Chip Poutine of the Prion Design Group and the guys (and girls) over at Metaversatility. Lush green rolling hills house the winery and a path that leads through the various stages of the production process. 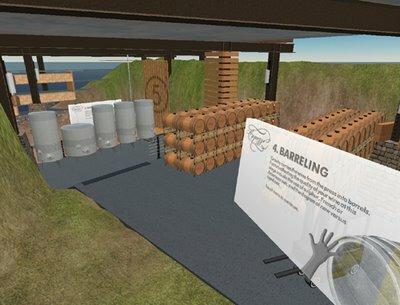 Though totally different in design than the Ben & Jerry's factory in Second Life, it's the same concept. So why the buzz? "On November 18, ‘05 pinotblogger was born. 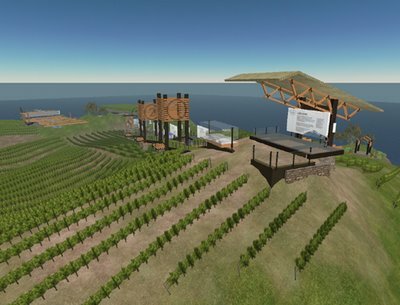 Its stated purpose is to “outline the long and painful processes involved in starting and building a family winery in the Russian River Valley. While we haven’t been at it very long nor has it been particularly painful yet, I’m 99.9% certain that at least one of these adjectives will correctly describe the project in the very near future (hopefully NOT painful and short though, as that would be sad)." 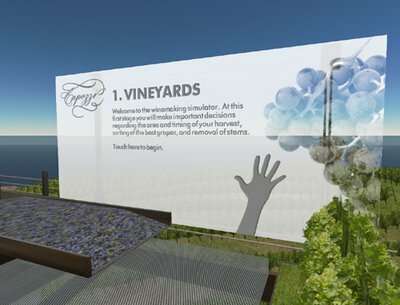 Meanwhile the Pinotblogger website has been been among the top 5 wineblogs in the world and gives a great insight in the business and starting up the new winery. The virtual presence complements this strategy. It's an all in, a 21st century marketing campaign from a traditional craft, that's a hyperjump. 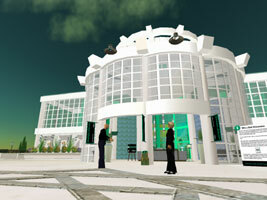 In the deep south of the Developers Archipelago lies the sim of AMD which opened mid February 2007. 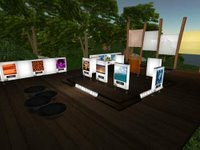 AMD is certainly not pushing the limits of Second Life's innovative potential, the sim is mainly used as a meeting point for techies with a few events. The design is quite sterile and you may have to wear sunglasses to protect you against snow blindness. The sim was constructed by the guys at Metaversality. 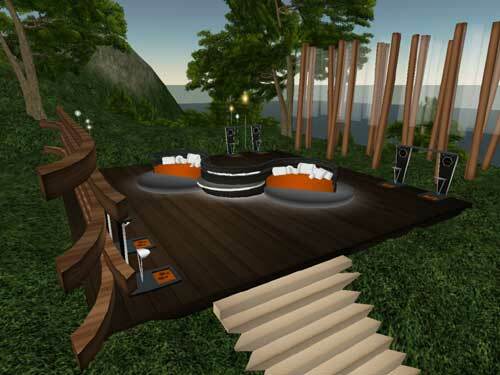 "MD Opens Developer Pavilion to Promote Collaboration and Innovation in Second Life and Beyond- Contestants face off to win an AMD powered Dell Dimension SystemDev Central Pavilion on AMD Dev Central Island located within the Second Life (SL) metaverse, to extend its Developer Outreach program into a virtual space for meetings, lectures, training courses and networking opportunities for developers. 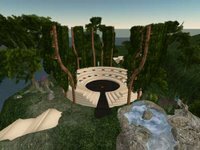 To celebrate the launch of the pavilion, AMD will host a three-month treasure hunt contest with interactive Linden scripting language (LSL) and open source programming challenges. 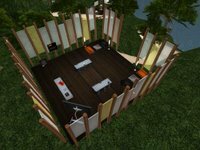 Developers who successfully complete the challenges in the Pavilion will be entered into a prize drawing for a Dell Dimension E521 system, powered by an AMD dual-core Athlon(tm) 64 X2 processor, 4GB DDR2 SDRAM, 320GB Serial ATA Hard Drive, 20 inch widescreen digital flat panelmonitor, and more."